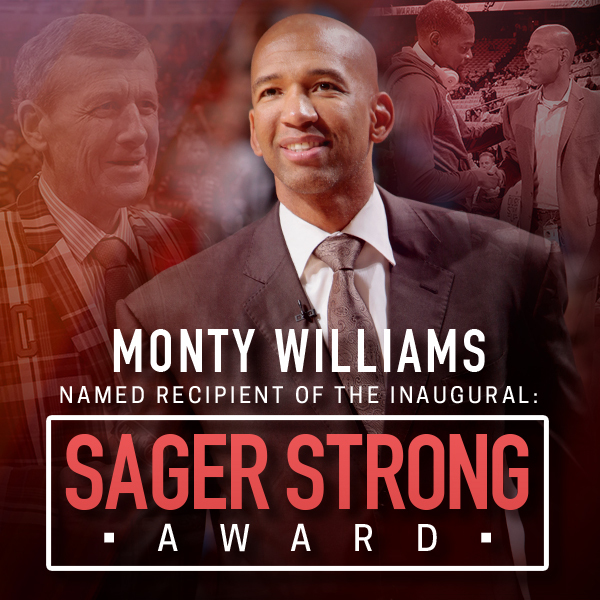 Turner announced today that Monty Williams will be the recipient of the inaugural Sager Strong Award at the first-ever NBA Awards on TNT, airing Monday, June 26, with coverage beginning at 9 p.m. ET. The Sager Strong Award, named for iconic Turner Sports sideline reporter Craig Sager, will be presented annually to an individual who has been a trailblazer while exemplifying courage, faith, compassion and grace. Williams’ career in the NBA spans over two decades, with nine seasons as a player before serving on coaching staffs with the Portland Trail Blazers, New Orleans Hornets/Pelicans (as head coach) and the Oklahoma City Thunder. He currently is the Vice President of Basketball Operations with the San Antonio Spurs. His legacy throughout the basketball community extends beyond the court, as someone who has repeatedly faced adversity while remaining a beacon of compassion, loyalty, faith and family. As the recipient of this award, he is being recognized as a revered friend and role model to many. In 2016, Williams tragically lost his wife, Ingrid, in a car accident. Williams, father of five children (Janna, Micah, Faith, Lael and Elijah), was a pillar of strength for his family as they overcame immeasurable adversity. Speaking at the memorial service, Williams inspired the masses through his actions as he honored his late wife, demonstrated his commitment to his family, and displayed compassion to the family of the other person involved in the accident. “Sager Strong” passionately spread throughout the entire NBA community during Craig Sager’s battle with acute myeloid leukemia. First diagnosed with cancer in April 2014, Sager passed away in December of last year. He was inducted into the Sports Broadcasting Hall of Fame in 2016 and was the recipient of a posthumous Sports Emmy Award earlier this year. Sager was also named the recipient of the Curt Gowdy Media Award and he will be honored by the Naismith Memorial Basketball Hall of Fame during its enshrinement events in September 2017. The NBA Awards on TNT, hosted by Drake from Basketball City at Pier 36 in New York City, will be the NBA’s official annual award show to honor all of the league’s top performers on one night for the first time.